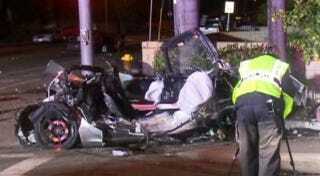 The driver of what's left of this Lotus Exige collided with the driver of the overturned BMW 330ci convertible late last night in Huntington Beach, California. Both were taken to the hospital, yet both somehow survived. Lotus drivers often claim they feel safer in their tiny cars because they're nimble and small can can aoid accidents. Unfortunately, when an accident does occur it's a reminder of the physics involved when a Bavarian brute and a little English car decide to wrestle. Police say the Lotus was heading westbound on Yorktown Avenue while the BMW was making a northbound left turn on an intersecting road. Witnesses disagree on who was to blame, but it seems from the photos at least one of the cars was traveling quickly enough to dislodge both of them.